This has got to be one of the best pranks I’ve seen in awhile. 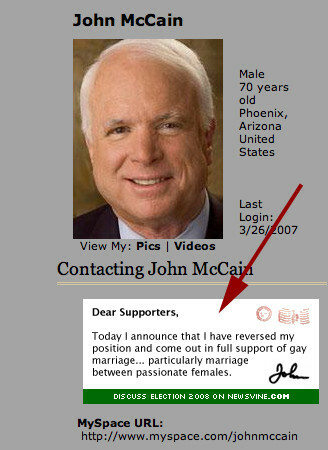 In short, John McCain’s MySpace page was using a template from Mike Davidson’s. That’s fine, except that McCain’s page was pulling images directly from Davidson’s server, using up Davidson’s bandwidth in the process. If you’re unfamiliar with the process, let’s just say that it’s a big no-no to use someone else’s image on your site by linking to the image on their site. It means that each time your page is loaded, the image has to get downloaded from their site. If you going to steal someone’s image, at least have the courtesy to upload it to your server first. Get the full story at Newsvine.com.